When xrays were first discovered they were rapidly put into widespread use in medical practice, without any regulation whatsoever. However, it soon became apparent that there were safety issues as patients and, more commonly, practitioners began to show signs of serious adverse effects. Dozens of the more enthusiastic early users of xray technology died as a result of the radiation dose that they received. You can read more about these so-called ‘xray martyrs’ here. In modern radiology departments like the one in SVUH, the imaging equipment has been designed to optimize image quality while minimizing the radiation dose to the patient, and is carefully monitored on an ongoing basis by a team of medical physicists. The radiation dose received by staff in the department is also monitored on a monthly basis, using small badges and/or rings called TLDs (thermoluminescent dosimeter), like the ones below. Radiologists and radiographers have received extensive training regarding radiation safety; one of the roles of our staff is to ensure that every imaging study is medically justified, and to consider whether the diagnosis in question might be confirmed by another imaging test without the use of ionising radiation. You should also be aware that, when you are qualified and have begun to order imaging tests yourself, there will be a legal obligation on you to provide sufficient clinical information to enable the justification of a medical radiation exposure. The hospital has a subscription to ‘iRefer‘, which is the Royal College of Radiologists’ online guide to making the best use of the Radiology department. This website allows users to select the most appropriate imaging test for their clinical question, and also allows them to ensure that a test they are requesting is clinically justified. The site can be accessed free of charge from the St Vincent’s University Hospital intranet homepage. Having said all that, almost all imaging tests that are performed involve a relatively small radiation dose, and the benefit for the patient of carrying out that test to make an accurate diagnosis almost invariably outweighs any associated risk. It is very difficult to quantify that risk; a widely publicized study in the New England Journal of Medicine in 2007 suggested that the widespread use of CT may now be responsible for up to 2% of all cancers, however there have been many other (more believable) publications which have quoted a much lower rate. So, right now, we’re not too sure exactly how harmful these studies are but just remember to ask yourself, every time: does my patient really need this test, and is there a test I could do that would answer the question without using ionising radiation? It would be worthwhile reviewing some examples of the typical doses involved when performing some of the more common imaging studies. These are usually measured in milliSieverts (mSv). The Sievert is the standard unit for measuring something called the ‘effective radiation dose’, which is a method of documenting radiation exposure that takes into account both the amount of radiation and the part of the body being exposed. This is because some types of tissue are more sensitive to the potentially harmful effects of ionising radiation; for example, the cells of the breasts, ovaries and testes are far more sensitive than those of the liver or skin. The table below indicates some of the average doses for several imaging studies. When assessing the significance of these numbers, it is helpful to compare them to the normal background radiation that we receive on an annual basis (in Ireland, this is approximately 3.4 mSv) or to compare them to the dose of a chest xray. Abdominal radiograph showing an unexpected (by everyone) late-term fetus. Wherever possible, we try to avoid performing any radiographs, CTs, fluoroscopy or nuclear medicine studies during pregnancy. Of course, clinical situations arise where these are necessary and cannot be delayed until after delivery. In these settings, we try to minimize the dose to the fetus, in some cases by modifying aspects of the study. The potentially-pregnant patient is also handled carefully; if there is even the slightest possibility of pregnancy in a patient referred for imaging, a pregnancy test is carried out. The image on the right, from a patient with ‘abdominal distension’ who did not know that she was pregnant illustrates the kind of radiograph we try to avoid ever seeing. 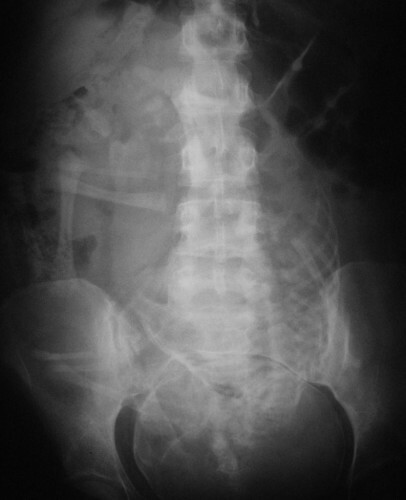 In fact, the risk of radiation-induced harm to the fetus from a single radiograph is actually very low at this late stage of pregnancy, however the potential for harm is significant in the first trimester for radiography, and at all stages for CT, which is the reason we are so meticulous about checking the LMP of women of child-bearing age prior to any procedure which involves the use of ionizing radiation.